The Airbrush Makeup Guru: How to save on Airbrush Makeup: discounts, coupons and seasonal specials. How to save on Airbrush Makeup: discounts, coupons and seasonal specials. In this post I would like to share some practical advice on how to save money on airbrush makeup. Whether you are a consumed professional or just a professional consumer, I hope you will find some of these tips useful as you prepare to invest in this wonderful, still relatively new makeup media. Subscribing to mailing lists can pay big! It is always a good and inexpensive idea to subscribe to a brand's mailing list, and to their Facebook pages and Twitter accounts. Airbrush makeup companies are still struggling to establish themselves in the mainstream of makeup marketing, so they still use their mailing lists a lot to promote special deals for their subscribers. 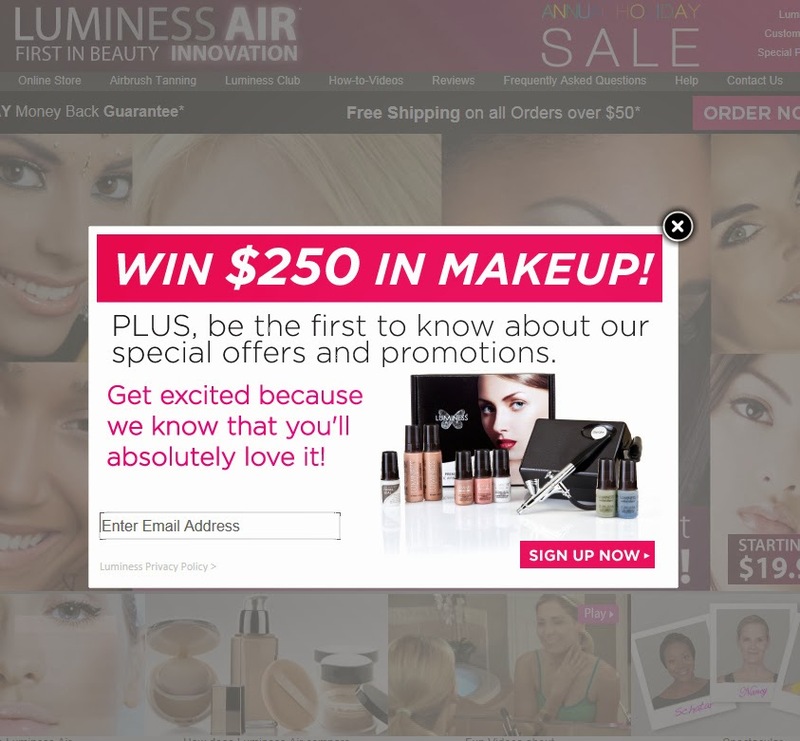 If there was a competition for who offers the best deals on their list, Luminess Air would certainly win the prize, with constant sales going on for their subscriber that will allow them to get truly remarkable discounts and often free shipping on top. They used to send $25 coupons to subscribers who had not bought with them for a while, but now they seem to have settled on general mega sales that will include everything from equipment to full kits and from foundation to skincare. Runner up for deal frequency would have to be Dinair, although their special are more often than not geared at new customers who will get extra products for buying a full kit. Range wide sales are extremely rare (Black Friday being the exception), and equipment and skincare sales are practically non existent. On the more professional oriented sites, Temptu Pro has a newly restyled website, and a good few specials have been popping up of late, so this is certainly a list you will not want to miss, while Kett's specials are extremely rare. This may seem counterintuitive, but some makeup stores do offer the best deals around, even beating the manufacturer's own prices. Take Camera Ready Cosmetics for example: they offer a low price guarantee on most of their products, they have a remarkable Pro Discount of 20%, their shipping charges are lower and their processing time faster than most of the manufacturers out there. They also have periodical specials that will allow you to save even more. So once again, joining the mailing list of several online makeup stores could save you quite a bit of cash. Following bloggers on Youtube and other social media may still be very worthwhile, although blogger power has been waning more and more in the last year. New companies used to flood the most influential bloggers with free product in exchange for reviews, and the bloggers themselves would then turn these goodies into giveaway prizes, but this strategy seems to have been more or less abandoned right now. A notable exception is Belletto Studio: with special discount codes and coupons associated with popular bloggers, their followers could get remarkable saving on their steep list prices. For example just a few weeks ago fans of Xparkage could get one of their "Ultimate Skin Secrets Starter Kit" for a laughable $99 instead of the "regular" $430 price. Of course there is always Ebay. Most of the times sellers are reliable and honest, however you should always keep in mind that even airbrush makeup has an expiry date, and that overstock sold by Ebay seller at discounted prices is often old batches that went into clearance. So be careful what you purchase, and don't hesitate to ask the seller for expiration dates or production dates. One way to see how old the product may be is to look at the pictures: do they show the latest graphics or packaging for the product, or are they showing old merchandise? All the major brands, from Temptu to OCC, to Dinair and Kett have updated their graphics and packaging in the last two years, and you can check their websites to see if what's being sold on ebay matches. Prodotti davvero eccezionali! Mi piacerebbe molto esser capace di creare tanta Arte! So if we used sparmarx, is it already continuous airflow? ?